Workplace raids and arrests of migrants at scheduled check-ins with Immigration and Customs Enforcement officers have sparked fear in immigrant communities around the United States. But most ICE arrests rely on a tactic developed during the Bush administration: pickups at local jails and state prisons. Those custodial arrests account for about two-thirds of the 143,000 undocumented immigrants ICE detained in 2017. 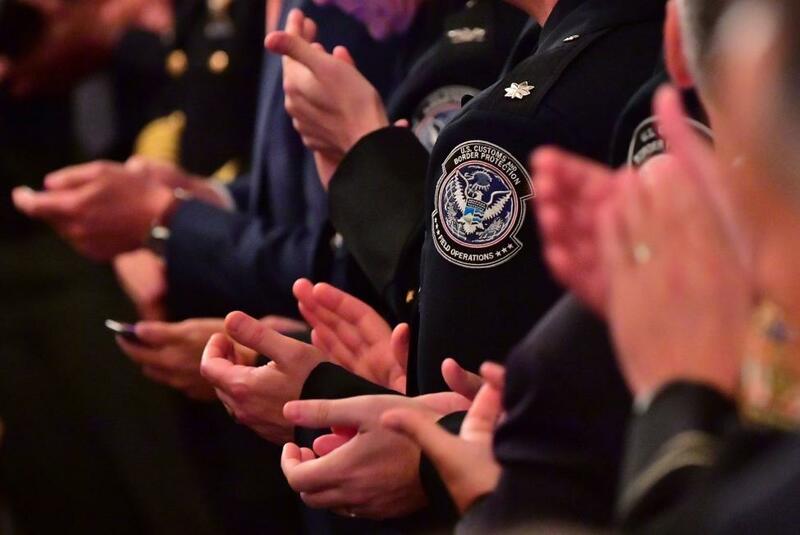 According to data compiled by Syracuse University's Transactional Records Access Clearinghouse, the Trump administration has increased "interior arrests" of undocumented immigrants by about 40 percent. An "interior arrest" is one that occurs away from the U.S. border, either in custodial settings, like local jails or state prisons, or community arrests at work, home, courthouses, or during a regularly scheduled appointment at the Department of Homeland Security. "It's almost like you flip a switch and you turn it back on again," Randy Capps said of the recent spike in arrest rates in custodial settings. Capps directs U.S. research programs at the Migration Policy Institute, a think tank advocating humane immigration policy. "Interior enforcement is just a return to the policies that had been in place at the end of the Bush administration and the beginning of the Obama administration." Sui Chung, a Miami immigration attorney who is vice chairwoman of the ICE National Liaison committee of the American Immigration Lawyers Association, said many of those detainees are picked up by local agencies for minor violations. "A lot of contact in the criminal universe is very minor things like driving without a license or traffic stops and that is resulting in a much more expeditious placing into removal proceedings," Chung said. President Donald Trump's executive order on interior immigration enforcement, issued within days of his inauguration, made "all removable aliens" in the United States a priority for arrest and deportation. In the final month of the Obama administration, ICE arrested 9,548 unauthorized immigrants inside the United States. By February 2017, that number had increased to more than 11,000 people. By March 2017, it was more than 14,000, and subsequently leveled off to about 13,000 per month, according to TRAC. "The number of people who have been convicted of a crime, but their most serious crime is a traffic offense, which is probably in most cases driving without a license or reckless driving, or an arrestable driving offense, those numbers have doubled. At the end of the Obama era, it was unusual for arrested immigrants not to have a criminal conviction, or just a traffic violation. But now it is happening again," Capps said. In fiscal 2017, ICE detained 15,593 people with no prior conviction through local jail bookings, a threefold increase over 2016, when 5,241 people with no criminal history were detained. Recent non-custodial arrests are also netting more immigrants without a criminal history. In 2016, of more than 11,000 non-custodial arrests 2,543 people were arrested who did not have a conviction. In 2017 that number shot up to 6,936 people without a conviction of almost 17,000 non-custodial arrests. Chung said ICE no longer exercises discretion if somebody is arrested for a minor offense. "The enforcement mechanism of this low-level criminal or traffic stop is a hugely successful enterprise for ICE to make more arrests," she said. Places with large immigrant populations, like California, Illinois and New York City, are fighting this tactic by prohibiting local law enforcement from cooperating with ICE. In these "sanctuaries", local law enforcement do not honor ICE "detainers" or immigration holds when a person comes into contact with law enforcement. Instead, local authorities release the person. "California's sanctuary policy is a big problem for ICE right now," said Jessica Vaughan, policy director of the Center for Immigration Studies, a Washington, D.C., think tank advocating lower immigration. "The size of the criminal alien population in California is very large relative to the rest of the country but ICE can no longer access California's jails because of the state's sanctuary law and that's very frustrating to ICE," she said. In contrast, sanctuary policies are illegal in Texas. As of March, local sheriffs who fail to hand over undocumented immigrants to ICE face stiff penalties. Workplace raids have created a climate of fear in immigrant communities, but they have not been uniformly applied. At the end of August, ICE arrested 160 suspected undocumented immigrants in a single swoop at a vehicle manufacturer in Dallas. Last month in Wisconsin, ICE conducted an "enforcement surge" over four days, arresting 83 non-citizens, half of whom did not have criminal histories. The Wisconsin arrests prompted swift criticism from Rep. Mark Pocan, D-Wis., who has sponsored legislation to abolish ICE. In Texas, during fiscal 2017, ICE made more than 70 percent of its arrests in custodial settings, according to TRAC's tool to calculate ICE arrests. Jail pick-ups are more effective -- and safer -- for ICE, as they take place in a controlled setting. "It is labor intensive for a community arrest. You can send an officer and a contractor and a bus and you can take 20 people out of a jail in El Paso or Houston. And you can get that many people in one day. If ICE had to find 20 people in the community, ICE would have to send a team of three or four agents after every single person. So it's harder to get volume," Capps said. Community arrests inspire fear among immigrants. "To have people being taken off the street like that in front of people," Vaughn said. "People start hearing by word of mouth that ICE is coming to neighborhoods and arresting people. They are afraid to go to the store, take their kids to school, whatever they have to do in their daily life, even though they aren't the target of these arrests; criminals are." Community arrests dropped in Austin after the new Texas law took effect mandating local authorities to work with ICE, said Rebecca Sanchez, manager of a deportation helpline for GrassRoots Leadership. "We haven't seen ICE coming into our streets or knocking on doors, or anything like that recently," she said. "The bulk of the upswing in ICE arrests is people being picked up out of county jails." In his January 2017 executive order, Trump called for increasing the number of ICE officers by 10,000, but it hasn't happened. "Congress has not stepped up to provide ICE with the number of officers it would like to have," Vaughan said. "That's very frustrating to ICE. They need to hire more officers to do this work, and they need their officers to be more productive, and they need the enforcement process to be more efficient with cooperation from local law enforcement." Any expansion in ICE's staffing has to be approved by Congress through the federal budget appropriations process. In fiscal 2018, Congress agreed to fund only 65 more positions at ICE.